Homestart Review: Is Homestart finance right for you? Note: Comprehensive Breakdown of Homestart Vs. Other lenders below – if you’d like to skip the read and get free advice on whether Homestart is right for you – call the mortgage broker expert Gerry on 0478 538 537 or email info@aplsfinance.com.au today. Buying your first property can feel like a daunting task – but it doesn’t have to be. For many people living in Australia the great Australian dream is to achieve home ownership at some point in their lifetime. For some people out there it may feel very daunting the thought of a long term financial commitment and while for others it may be a bit of a struggle to get the deposit funds together to make this dream reality. Many South Australians to this day believe the best way to go about getting finance for a home if you are making your first purchase, are casually employed or have a smaller sized deposit that the only option is to go through HomeStart as they will be the only suitable option. As times have changed this is far from being the truth as the reality we now live in, many of the lenders now are more flexible with their polices, acceptable of lower deposits and acceptable of casual incomes. Many of the mainstream lenders who offer loans above 80% of the Loan to Value Ratio (LVR) will charge a fee called Lenders Mortgage Insurance (LMI). The way the rates are calculated and charged for the amount of LMI payable is by a scaled method – the higher the LVR, the higher the rate of LMI is charged, likewise the higher the loan value, the higher the charge. Whereas HomeStart charges what is called a Loan Provision Fee (LPF) which is charged based on the total LVR and in most cases a much cost effective alternative when comparing the LMI and LPF. Many lenders in the current market have the ability to offer bargain basement rates and many are competing against one and other offering many of the same benefits with some having specific niches more suitable for different situations. Based on the findings with loan products on offer at the present time, HomeStart’s current variable rate is 5.24% when you can go to a mainstream lender such as Bank SA with their Basic variable home loan at 3.80%. This is a total difference of 1.44% and not to mention Bank SA has a more relaxed approach of being accepting of proposed deals, being cost effective and consistent long term. Please find below a scenario comparing the HomeStart Home Loan and the Bank SA Basic Home Loan showing the two loan products. Sally is a single female living in Adelaide looking to buy her first home in the suburb of Ingle Farm. Sally has been employed with her current employer for the last 4.5 years and earns $69,000 per year before tax. She currently lives at home with parents rent free and has no liabilities and saves as much as she can each week. The only costs she has to cover while living with her parents are her phone bill, maintenance and running costs of her car and personal items such as clothing, going out to dinners etc. She has been able to save up a total of $71,500 which she is planning to use as a deposit towards her first home purchase. Sally decides to talk to a local mortgage broker about her options and says that she believes HomeStart will be the right path to make her dream a reality as she has heard about them on radio advertising. Once talking to her finance broker and having her situation reviewed, the broker tells her that even though they can write loans with HomeStart and she does have the ability to obtain finance through them, she has alternate options that are actually more suitable to her current situation. 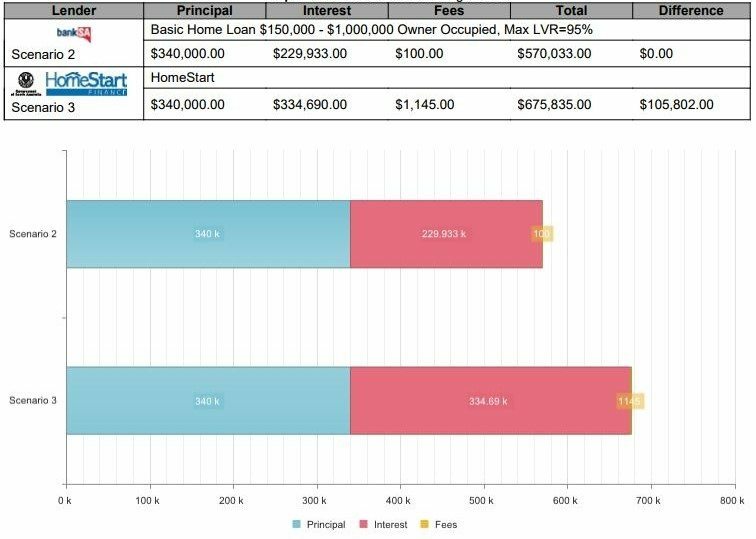 The mortgage broker proceeds to outline to her what the overall breakdown will look like with HomeStart and then with Bank SA showing the comparison between the two products. While you can see HomeStart’s initial setup fees are substantially cheaper than Bank SA, the total amount of interest payable with the HomeStart product based over a 30 year loan term equates to an extra $105,802 more than what you would pay if you were on the Bank SA product. This adds up to an extra $3,527 per annum which when broken down equates to approximately 2.2 months’ of extra repayments which the funds could be utilised to your advantage and put towards the home loan. HomeStart’s Manageable Loan Repayment Safeguard works out your initial repayments based on your financial situation, not just interest rates. Usually, the only change will be an adjustment for inflation once every 12 months. So if interest rates go down, you’ll pay your loan off faster. If interest rates were to increase by 1% per annum with HomeStart the monthly repayment would not change in most circumstances, however the loan term may be extended. Below you will find a Home Loan Comparison chart that compares both the HomeStart and Bank SA home loan products showing that the same amount of principal will be repaid, however the total amount of interest and fees payable is far greater with HomeStart. Over the total time of existence, HomeStart has helped in excess of 66,000 households in South Australia with home mortgages, keeping in mind this is restricted to buyers and purchases in SA only. It goes to show there was a time HomeStart was a suitable service provided to many property purchasers in comparison to what mainstream lenders were able to accept and offer. For a number of purchasers it was the only option, now HomeStart’s interest rates are substantially higher, they have a more strict lending criteria with little flexibility. With a large number of lenders and their policies now in place it is safe to say if you are dealing with an accredited experienced mortgage broker there will be a number of options no only available but actually suitable to you compared to what HomeStart now has on offer. Any experienced finance broker who is accredited with HomeStart will consider this option and providing this as a recommendation and also take into consideration should this be the absolute only option to be able to get into home ownership, but once again this should be strongly considered. A mortgage broker will work hard to carry out the in depth research and be able to provide to you your most suitable options available. HomeStart used to have a great model in place and being that it was one of the few options for many South Australians over the time of existence to get into the home ownership market was very useful and not to mention a great alternative for home buyers. Unfortunately for HomeStart the mainstream lending world has rapidly evolved with becoming more flexible and having the ability to offer you as the home purchaser aggressively low rates and sharp products. If you would like a to know more about which lender is most suitable to you and the options available please don’t hesitate to get in touch with your local Adelaide mortgage broker Gerry today to talk about getting a free home loan review and he can talk further should there be any questions/queries you may have.